TOP QUALITIES: "Great Results, Experts, High Integrity"
Legal Analyst Gambling Compliance Ltd.
"Given Gambling Compliances remit of covering regulatory and market developments and change in gambling jurisdictions across the globe, knowing the right people to talk to on-the-ground is vital. Whenever I need to know what is happening in Romania I do not hesitate to pick up the phone and talk to Bogdan Mararu from Mararu & Mararu. He has always found time to assist me and explain Romanian developments in a clear, concise and learned manner. Moreover, the insights, knowledge and contacts Bogdan possesses are an invaluable source of information, helping to put Romanian regulatory developments into context. For these reasons I do not hesitate in recommending Mararu & Mararu as the first port of call in coming to grips with Romania’s fast changing gambling laws." 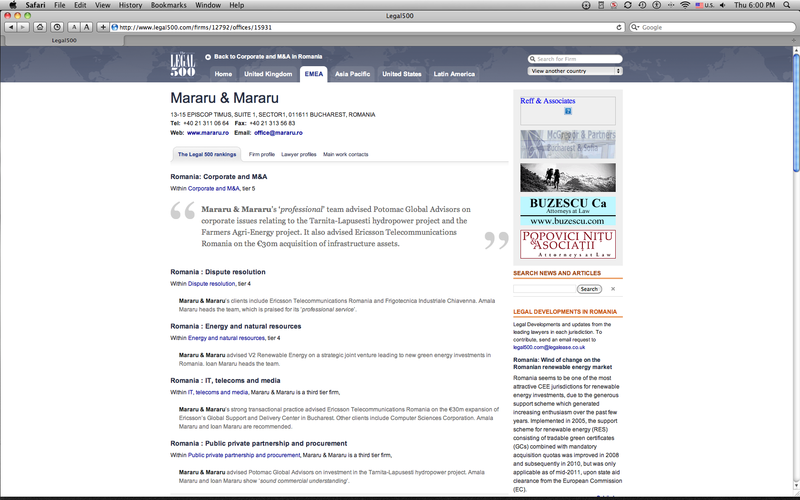 "Mararu & Mararu rapidly showed a deep understanding of our company's needs on Romanian market and, as a measure of a high standard of service and business orientation, they are still constantly updating us on their legislative initiatives, their practice updates and on the Romanian legal developments and opportunities. Ask them a question - definitely you won´t wait too long for their meticulously precise answer. With Mararu & Mararu, you will safeguard the best market entry strategy and will put in order your most delicate, aggressive or challenging business plans!" TOP QUALITIES: "Expert, On Time, High Integrity"
"Amala Mararu is a smart, likable and experienced lawyer, with extensive connections both in Romania and abroad. I would recommend her firm." TOP QUALITIES: "Great Results, High Integrity, Creative"
"Mararu & Mararu is a very professional law firm providing their services always in time and of quality, even if there are tight deadlines and time is short. They consider not only the purely legal point of view but the practical and commercial point of view as well, which is important if advising a corporation. It is always a pleasure to work with them, because their approach is personal, unlike in many other larger law firms. To sum up: they are our “trusted advisors” for our Romanian business." TOP QUALITIES: "Good Value, On Time, High Integrity"